Page Street Publishing, 9781624145087, 208pp. 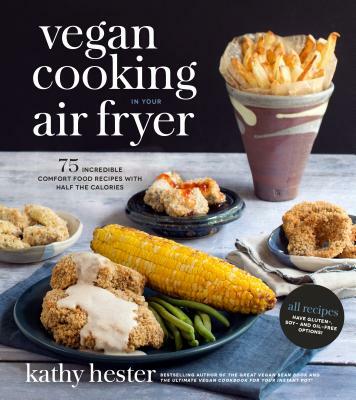 Vegan Cooking in Your Air Fryer provides plant-based dishes with all the decadence of fried food without the added calories. Using little to no oil, these recipes result in wholesome and delicious meals with less mess, but the perfect texture, everytime. You will be amazed at how fast you can have dinner on the table using your air fryer. With recipes like Black Bean Avocado Chimichangas, Cheesy Hot Sauce Collard Chips, Cajun French Fry Po’Boy with Vegan Mushroom Gravy and Banana Spring Rolls, plus techniques that yield crispy tofu to rival any restaurant, Vegan Cooking in Your Air Fryer makes healthy eating easy, fast and tasty. Kathy Hester is the bestselling author of The Ultimate Vegan Cookbook for Your Instant Pot®, The Easy Vegan Cookbook, The Great Vegan Bean Book and The Vegan Slow Cooker. She is also the blogger behind HealthySlowCooking.com and lives in Durham, North Carolina.